While at a LOST premiere party tonight a friend showed me Felt Alive‘s Flickr pool. I must say, it’s an awesome find! 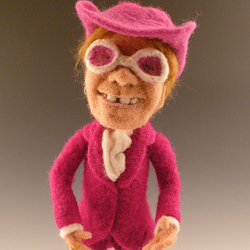 She has made a number of needle felted celebrities including the felt Elton John pictured here, Conan O’Brien (being attacked by a polar bear), Willie Nelson, and the Beatles! Check out her Flickr for all of her celebrity felt-a-likes! WOW! That is the cutest thing I have ever seen!!!!!! OMG, little Willie Nelson! Beetles! Genius!!!!! This is hysterical. So Laurie’s even more out of it than me? Hard to believe. I can’t figure out why there aren’t already a zillion amazing comments on this here! THis So Rocks My SOcks! Totally friggin’ awesome. Wow. Amazing work!!! And I LOVE Elton John!!! !